Yesterday I was able to visit 3 thrift stores in my area that I had never been to before. The first one was a HUGE find. For those in Central Florida please visit Nana’s House thrift store located on Malabar Road in Palm Bay. The proceeds of this thrift store go to help Nana’s House which is a 501c3 non-profit that helps abandoned and neglected children. The women were wonderful to talk with and the amount of quality products were huge. I would ask that you pray about donating items or giving directly to this organization. 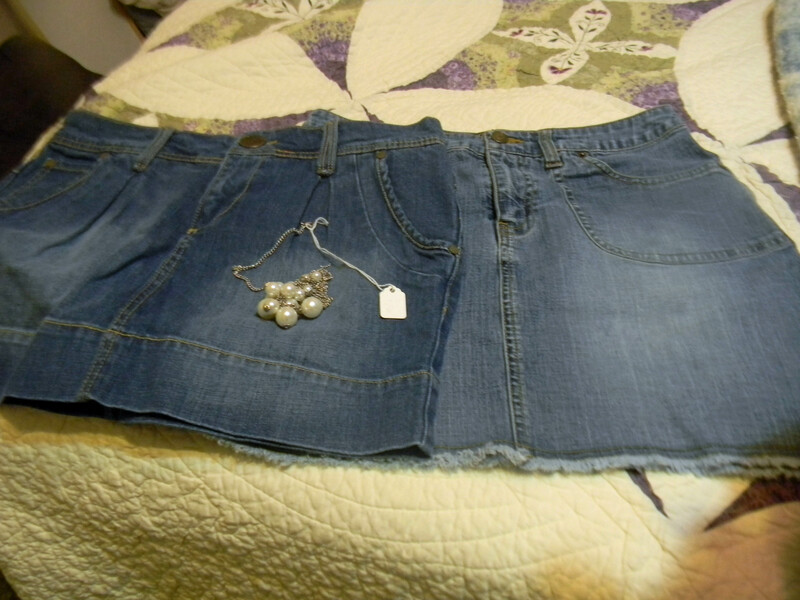 At Nana’s House I found a really funky pair of shoes, 2 short skirts to repurpose and a cute necklace. 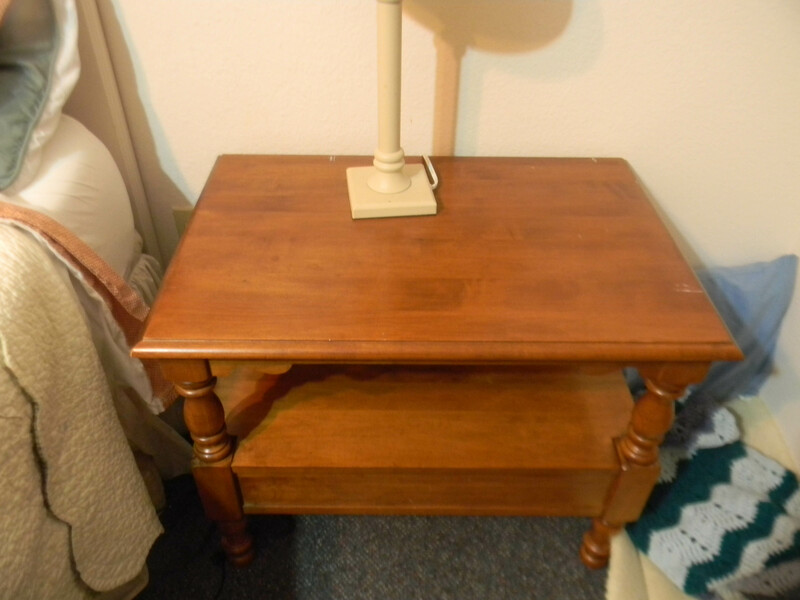 The big find however was an end table which I am using as a night stand. I have been looking for one for months! I was using a tray table, so glad it is now put away. I only paid $17 and it is solid wood. I may refinish it in the future, but way to many projects right now. This must be the year to get rid of short skirts as I am finding them everywhere! Yeah for me. Now to find material. Today is my birthday and I have been reflecting a bit this year. Last year I was still steeped in my mothers passing and didn’t do much thinking. I still miss her so much and truly understand what all my sisters have gone through when their own mothers died. Lets see if I can recap the changes/events that have happened this past year. I went to visit my family in Alaska August of last year. It has been a while since I had been back. Had a GREAT time. My dad flew here in December and spent a week. I ended up in the hospital in January. They thought I might have had an inflamed appendix and almost did surgery. My husband and I celebrated our 30th wedding anniversary several months late by flying to Ohio and staying in an Amish B&B and then visiting family. I have gone off gluten. I am trying to go off all chemicals. I now make my own soap and most cleaning products. I no longer use shampoo. Yehovah convicted me of wearing a head covering during prayer (1 Corinthians 11). More recently trying to wear more skirts. Started a business “Handmade for Bibles“. All proceeds go to purchase bibles for V.O.M. I now volunteer at my church on Thursday afternoons. I am trying to eat more organic and healthier. I am trying to go to more sustainable gardening. I have butchered a live chicken. I created/sewed a large project for my 2 great nieces. Painted most of my house and updated both bathrooms. I facilitated a summer bible study. Attended a college bible class. Began studying the Old Testament in-depth with Torah Class. Read two great books “Never Silent” and “Good News About Injustice“. I think every Christian should read these books. OH YES and started to blog. I don’t think I have ever sat down and reflected over a year past. I hope to do this again. I think this past year has been the most change I have ever had in my life. I pray that Yehovah will continue to use me to make His name famous. This entry was posted in Daily Life, Posts and tagged birthday reflections, reflections, repurposing, thrift store finds. Bookmark the permalink. Happy Birthday! What a thoughtful, lovely post. Such great finds too! Love the shoes! Thanks, I love funky shoes. 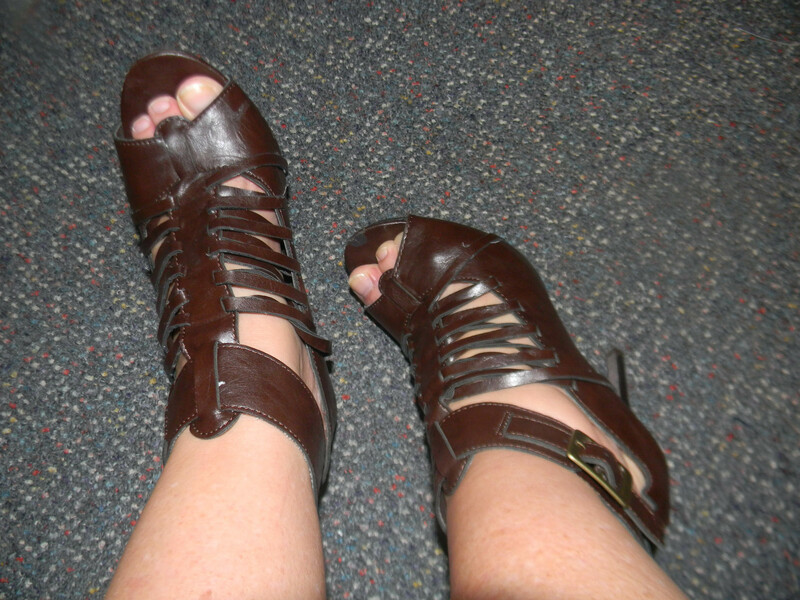 The ladies at the thrift store couldn’t believe I could walk in them! I can’t wear heels at all. But I love the look of them. I only wear them to church, lol. LOL! I like your style!